The weather certainly seems like high season. Today has been hot and sunny with light winds and the evening is cool and clear. And I have a little holiday - a week away from the office before the diving high season starts. I hope the weather holds. A bit of beach time would be nice tomorrow. 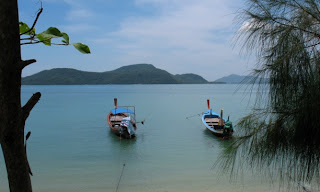 The Phuket Weather blog has been online since May 2006, nearly 2 and a half years. I hope it's been useful. Thanks to everyone who has left comments. I am very happy to say that as of yesterday, a Google search for "Phuket Weather" showed the Phuket Weather blog top of the tree, king of the road, number 1. So, con permiso, I would like to say "YEEEEEEEEEEEEEEEEEEEEEEESSSSS!" Today we took a little drive to the Phuket Aquarium. Kids request. It's school holidays right now. Yes we have been many times before, but I always enjoy taking the kids to the aquarium. Every time they learn a bit more, some new fish names. My 3 year old boy is a big fan of lionfish. I took some little videos of the aquarium this time and will add to Jamie's Phuket sometime after the end of the vegetarian festival. But here's a photo of the view outside the aquarium today. This evening we all went into Kathu Village. I was hoping to see some "bladed ladder climbing", but it seems this had been cancelled for this year. The festival schedule I had seen on the Phuket Vegetarian website and copied onto Jamie's Phuket was not quite correct! There were quite a lot of tourists around hoping to see the same thing.. If you had read about bladed ladders on Jamie's Phuket.. sorry about that... Neverthless, I bought my vege food and took some photos around Kathu shrine (which is just a few minutes drive from our house). Oh, can I just say again. Weather in Phuket is absolutely gorgeous right now, and can I say again "YEEEEEEEEEEEEESSSSSSSS! ".